Crush, Texas was a town for only a day in the late summer of 1896. Locate about 3 miles south of the town of West it was the site for the biggest publicity stunt of the time. W.G. 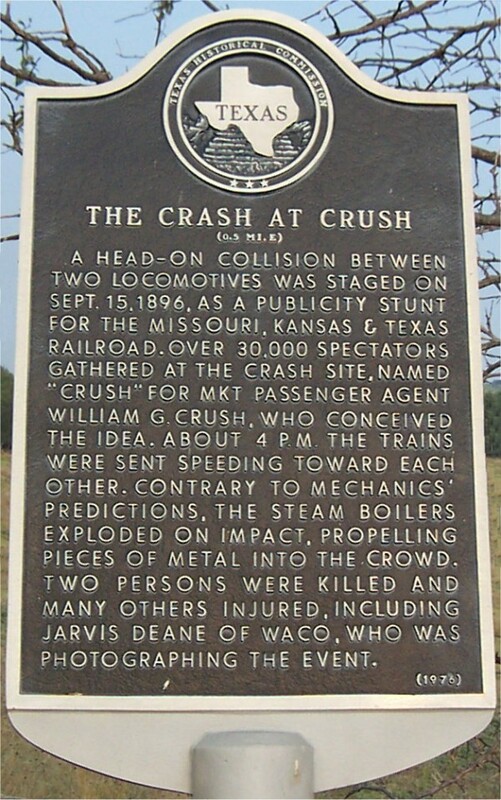 Crush, general passenger agent of the Missouri/Kansas/Texas (Katy) Railroad, came up with the idea of crashing a couple of trains together to attract public attention to the railroad company. The site was selected and a date was set for September 15, 1896. For months the event was promoted by the railroad company with posters and ads in newspapers along the railroad towns for thousands of miles. A separate set of tracks were laid along side the railroad. Two trains that were being retired were selected for the event. Test runs were performed to get the speed right. The railroad company was sure it had made appropriate modifications to the engines to prevent any kind of explosion. After all, the attraction was publicized as a safe event. People swarmed in for the event. Many walked or came by buggy so no accurate number of spectators could ever be determined. Estimates range between 30,000 and 50,000 people attended the attraction. Although there was no charge to attend the crash the railroad sold lots of tickets to bring passengers to the new town named in honor or Mr. Crush. Two-hundred constables were hired to control the crowd and a jail was built to hold the law-breakers. The trains were freshly painted. One was painted green with red trim and the other red with green trim. Each pulled several cars behind with advertising space. The two engines rolled up to each other for a cheer from the crowd. Each rolled back a distance of one mile. When Mr. Crush gave the signal the engines roared toward each other at full speed, the engineers jumping off to avoid the collision. The locomotives hit with a crash which was followed by a roar as one of the boilers exploded sending debris in all directions. Two people were killed and more were injured from the flying pieces. Others were burned as they rumbled through the wreck for souvenirs. Mr. Crush was fired from the railroad but was later rehired when the publicity of the stunt in the end turned out to be positive for the railroad. Photos of the crash and pieces are on display at the West Depot along with detailed accounts by spectators. Click here for more info and photos of the Crash at Crush. <— Click there to enlarge the historical marker.